The visual identity of your company is crucial for your client relationships. It reflects the image that you want to present to the outside world and therefore it must be considered carefully. SFM employs a full-time professional graphic designer in order to provide excellent service to our customers. Your company logo will be designed according to your specifications and based on a theme that you are welcome to provide (depending on the activity of your company) or without any particular theme. The cost of this service is € 250. 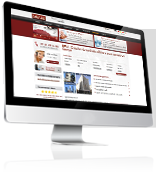 SFM can also take care of creating your company’s website. Click to discover our three offers, adapted to your needs.